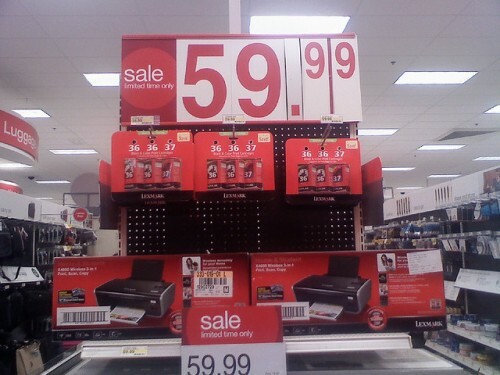 What’s the Best Font to Use to Save Money on Printer Ink? Not all fonts are created equal, and chances are that you’re wasting money every time you print a sheet of paper simply by using the default font on the document. In fact, a Pittsburgh teenager named Survir Michandani, doing a science fair experiment, has estimated that all levels of the US government could save hundreds of millions of dollars a year by simply changing the font that they use on documents. So, what is the best font to save money on printer ink? Switch to Garamond (see image above). 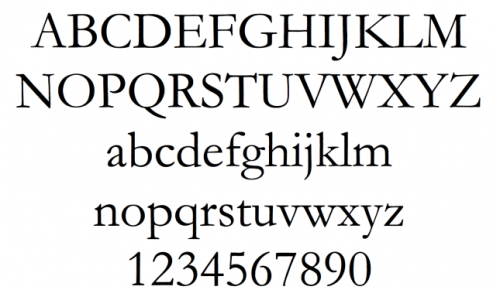 Michandani estimated that the US government could save $234 million per year by switching to the Garamond font from the current fonts they use for their documents. This number was extrapolated from him trying to save his own school money on printing costs. Michandani noticed the large number of printed handouts and lesson plans he was getting in school. He realized if he was getting so many handouts, that amount must be huge when extrapolated out to the class, school, and district. He decided to figure out if there was a way to save money on printing costs for his school district. He found that the cost of printing materials for students was something that his school district had already addressed. They had implemented a plan to print on both sides of paper and to implement a recycling policy to help reduce costs. One area where they hadn’t been able to make much progress was on the cost of ink. Michandani decided to focus on the words being printed on the sheets of paper. As he analyzed the handouts, he concluded that there were five letters which were the most commonly used: a, e, o, r and t. He took each of the letters and printed them in four different fonts: Comic Sans MS, Century Gothic, Garamond and Times New Roman. He then used a software program called APFill Ink Coverage to determine how much ink was being used by each font to create the common letters on a piece of paper. He realized that the thinner Garamond font was using less ink to create letters than the other three fonts being tested, and by switching, the school district could save a significant amount of money on printer ink. 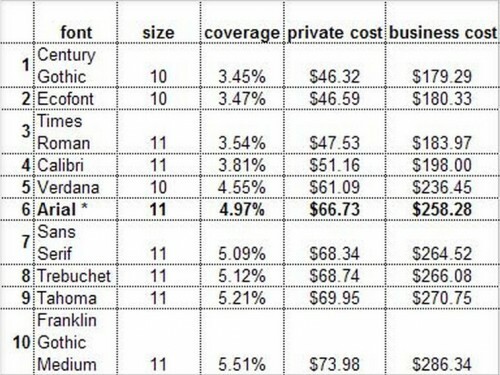 He calculated that they could save about $24,000 a year by switching fonts, which would reduce their ink costs by 24%. He didn’t stop there. Taking into account the same principles, he decided to apply the cost savings to the entire nation including local, state and the federal government. His conclusion was that as a nation, the US government could save $234 million a year by making a simple font switch. Just the federal government could see savings of as much as $136 million from the $467 million they spend on printer ink each year. Michandani isn’t the only one who has considered how the type of font used can make a difference in the amount of money spent on ink. Printer.com ran a test a few years ago using the same APFill Ink Coverage software to compare different fonts and how much ink they use. 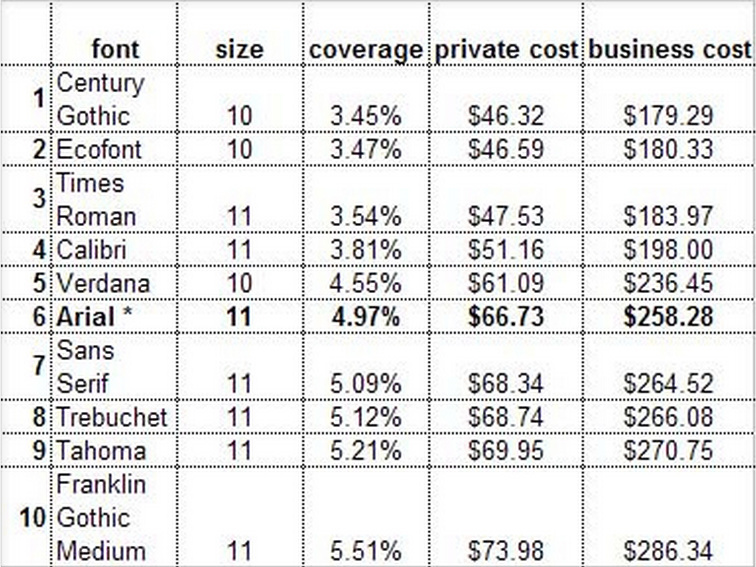 Their results indicated that using certain fonts rather than others could reduce ink costs by as much as 31%. While they did test more fonts than Michandani (they used the 10 most commonly used fonts), they did not include Garamond so that a direct comparison isn’t possible. Using Ariel as the base font, they concluded that Century Gothic was the font that used the least amount of ink, beating out even Eco Font which was created specifically to save printer ink. Their test results indicated that an average person who printed 25 pages a week would save about $20 a year if they simply used Century Gothic for all the pages they printed. What does this mean for you? It means that you’re probably wasting ink and money by using fonts that use more ink than others. Instead of printing everything using the default font, changing the font to either Century Gothic or Garamond will save you money by using less ink and having to replace ink cartridges less often. Also consider going with digital signatures or other digital authentication methods. Combine these with other ways you save money using your printer at home and you should be spending less using your printer in the past. Once upon a time, we did not have giant landfills full of refuse from all of our disposable conveniences. We relied on reusable items to fulfill our daily needs and we found ways to prolong the utility and longevity of what we owned. Americans were frugal by nature. After WWII, however, our national prosperity and an increase in our collective leisure time brought forth an era of disposable convenience. Instead of looking to buy products that would last, we began to look for many products that could be tossed away when we were done using them. The most egregious and downright silly of the disposable products that I recall are the paper dresses that were sold in the late 1960’s. These dresses were offered first by Scott Paper Company, and then by Hallmark and even Pillsbury, among others. Paper dresses were sold in surprisingly huge numbers – half a million by the Scott Paper Company alone – and were to be thrown away when they had been worn out in anywhere from one to twelve uses! Fortunately, I have not seen too many paper dresses or other paper attire recently, but there are still a number of costly disposable items that we do still use, and they impose a burden on our environment and our wallets. Here are five that you should do without. Disposable Razors: For years, I used a disposable razor. I have a thick beard so if I used a razor more than once, I would invariably look like a victim from a slasher film. Nevertheless, for years, I spent about $6 per week on disposable razors. Then, early last year, I saw a great deal on an electric razor on Amazon – I think I paid $49 for a $189 shaver, or something similarly discounted – so I made the investment in an electric razor. I have used it ever since and instead of spending $6 per week I spend nothing more than a couple of pennies to charge my razor. I save money and I keep plastic and metal out of our landfills by not having to throw away a package of used razors every week. Paper Towels and Napkins: There are only two reasons that you really need to use disposable paper products: if you are in the bathroom or if you need to write something down and cannot use an electronic device to do so. Otherwise, most disposable paper products can be replaced with longer lasting reusable products. Rather than spend a dollar or more per roll of paper towels for your kitchen, invest in a dozen or two cloth towels that you can wash and reuse. Rather than use disposable paper napkins, invest in basic cloth or linen napkins that you can similarly wash and reuse. Chances are good, that if you are shopping a lot in the paper products aisle of your grocery store, you are unnecessarily throwing away your money with your disposable paper. Plastic Utensils, Paper Plates and Disposable Cups: Whether you use them outside or indoors, plastic eating utensils, paper plates and disposable cups offer you a minimum of convenience and a maximum of waste. Rather than serve meals on disposable products, buy a set of sturdy hard plastic plates and cups that you can use whenever you need them, indoors or out. They will not break if they are dropped and they can be cleaned and reused, saving you the cost of replenishing your disposable stock. Of course, I would not suggest that you serve a picnic lunch on your fine china, but it is a waste of money to buy disposable plates, cups or utensils. Coffee Cups and Coffee Filters: I try not to buy coffee when I am out of the house. In case I decide to treat myself, however, I always carry a travel mug from the coffee shop that I prefer. The travel mug cost me $2.49 when I bought it, a price that included a free cup of coffee which usually sells for $1.69 per cup. Refills are only 99 cents so I save 70 cents on every cup and the travel mug has already more than paid for it. I often carry a thermos of coffee with me when I do go out and I fill my own travel mug up. When I brew coffee at home, I always use a permanent gold filter in my coffee maker rather than disposable paper filters. I do not save a lot of money by using a permanent filter (about $2.00 every six weeks) but I never have to worry about running out of filters. Printer Ink: Many of you probably already do this but I find that there is no reason to purchase new ink cartridges for my printer. I take my used cartridges to an office supply store near my home and they refill them for less than new cartridges would cost. The quality is just fine and the price is better than the cost of new cartridges.